American Freedom Watch Radio was established to share truth, education, conversation and action. Each week we will be joined by an expert guest to discuss an issue and solutions. 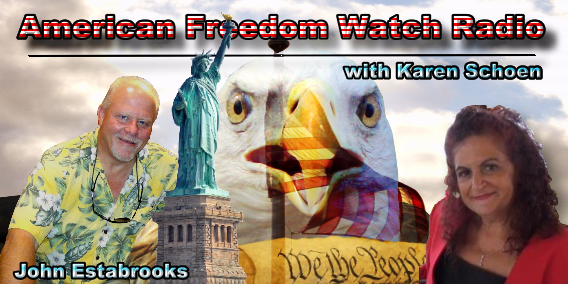 American Freedom Watch alerts American Citizens to all attacks on their Freedom. Each show will contain an in depth analysis of an issue facing America with an expert in their field. We will connect the dots, discuss the plan, implementation of the plan and solution to protect yourself, family, community and country. I am a teacher. It is my expert opinion you can not solve a problem unless you know its history and its implementation plan. Then and only then can you plan for yourself to find a workable solution. I believe that one of America's biggest problems is the anti-constitution, anti-individual rights and freedoms, anti-family , anti-God aka morality, and basic anti-American curricula currently in our schools. This curricula starts in pre-k. We can fix every issue but if we do not address the basic anti-American indoctrination currently in our schools we will NEVER change anything. Once indoctrinated, in 8 years the new graduates getting jobs in government, will put us back where we started as they shout out of ignorance, yeah communism. I believe that The American people have been kept ignorant for a reason. Ignorant people are easier to manipulate and control. Students are taught to accept crumbs not achieve success. The mission of this show is to tell you the truth, educate you, teach you how to communicate the truth and chart a course of action leading to solutions not crumbs. John, my co-host, with his valuable input will join us whenever he is off the rig. John and I believe we are Americans, not hyphenated Americans, just Americans, the last group of free people in the world. Let no one divide us. Let us stand together united in Freedom and Liberty. American Freedom Watch Radio, December 9, 2015 with George W.
American Freedom Watch Radio, November 11, 2015 Randolph G Russell - American History You Forgot! John Estabrooks is Drilling Fluid Engineer with 36 years of experience with 15 years in Ultra-Deepwater Exploration and Development Drilling. John is the Louisiana Education and Strategic Planning Committee Director for the Patriotic Resistance. John is also an Advisor to the Board to the Southwest Louisiana Tea Party. John is a public speaker, national blogger and political activist. John and Karen have been hosting American Patriot Radio for the last 5 years after we came together to expose the administrations failing from the gulf oil spill. We discuss controversial topics like Agenda 21, common core, energy and provide solutions. We offer NO PC just the truth. Karen Schoen originally from New York currently resides in the Florida panhandle, a former teacher, dean and business owner who became an activist and devotes her time speaking to groups throughout the United States educating Americans on UN Agenda 21 (a.k.a. Sustainable Development) Sustainable America, Resilient cities, Smart Growth, New Urbanism and the new Agenda 2030. Karen has a Bachelor’s Degree in Education, minor in History and a Master’s Degree in Liberal Studies and post graduate credits from the New School of Social Research where she was trained in psychological manipulation now applied in government schools. 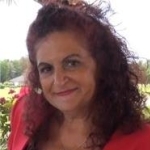 Karen has testified in front of the Florida Legislature, is a Director of Panhandle Patriots, a founder of the AgEnders (Americans ending Agenda 21) , Co-chair of the Florida Assessment Committee on Education. In 2014, Karen was a candidate for Florida State Representative. Karen Schoen has a B.S. in education and history from SUNY, in Oswego. and an M.A. in liberal studies from SUNY, in Stony Brook. Karen did her post graduate work at the New School of Social Research.